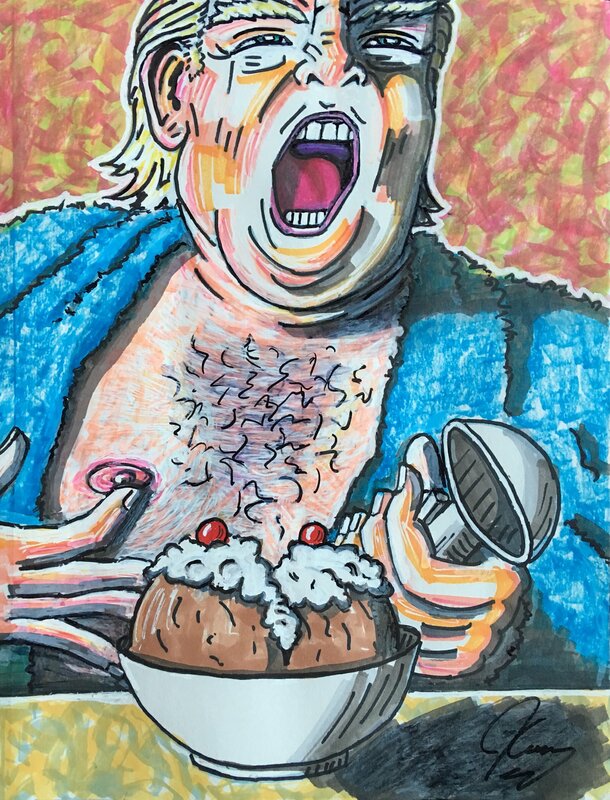 Michele Maccarone is the founder of the Maccarone gallery in Los Angeles and from October 13 through November 10 she will exhibit 80 of Jim Carrey's cartoons and one painting that he as shared in his twitter, ever since Donald Trump was elected as the President of U.S.A. It will coincide with the November 6 midterm elections, but it's completely deliberately. They first met in 2013 when she was doing the exhibition 'Creating Reality, by Andy Kaufman'. Jim Carrey loaned some selected ephemera from his own personal collection. Years later she saw Jim Carrey's cartoons on Twitter and was totally captivated by them. "The cartoons seemed so urgent to me. I immediately felt the impulse to exhibit them. At the heart of it all, I have always gravitated toward art that was urgent, unafraid. And now in a moment when I feel so frustrated with the world around us, here is Jim with a voice that is also a vehicle for my own. It seems to me that artists in other parts of the world are doing a better job at protesting and engaging with political dysfunction than we are here in the US. This exhibition is a protest, regardless of what happens in the midterms." But Michele Maccarone isn't afraid of the commercial risk she may be taking: "I believe in this message and that's all there is to it. The real risk is saying and doing nothing." We gotta say� we completely agree.